Every community that owns property and whose “origin story” I know has a few things in common: someone(s) with passion for doing something you can’t easily do within the mainstream culture, a combination of persistence and luck, and one or more people with enough class privilege involved to get the thing landed. While we talk about the first thing a lot, and the second thing some, the third element is one we either treat as an “of course” or never really think and talk much about at all. I’d like to change that. I think it is increasingly important to not only talk about the role class privilege plays in our movement, but also celebrate the ways that cross-class cooperation can be a form of solidarity that is very much needed at this time. Land access is a fundamental barrier to many things in the US: being able to grow your own food, being able to build equity and wealth, being able to have a direct and daily relationship with the natural world, and being able to start an intentional community are just a few areas in which lack of enough wealth to own property further limits our capacity to have our dreams become realities. Much work has been done on land and property access inequities, including detailed studies of practices within the banking industry such as “redlining” (where banks used to literally draw red lines on a map indicating where they would and would not give loans to mostly Black families) and the ripple effect those practices have had on the discrepancies between Black and white families and intergenerational wealth building. (An article on www.citylab.com from April 2018 called “How the Fair Housing Act Failed Black Homeowners” is one good intro to this topic.) Groups such as Cooperation Jackson in Mississippi and the People of Color Sustainable Housing Network in the Bay Area understand the importance of restoring access to land as part of an overall strategy of racial justice. In my experience, the main reason intentional communities fail is social dynamics: we aren’t taught by our culture how to get along, make decisions collectively, and resolve conflicts, and lacking those skills, lots of groups flounder. But I am also increasingly tuned in to how many groups simply never get the chance to fail because of economics. If you don’t have people with some wealth involved or at least people who have done well enough to be able to get bank financing, then a lot of dreams die as wee sprouts. I’ve been part now of multiple intentional community start-up attempts. In the two cases where we got far enough along to be ready for the property acquisition phase, one of the critical determiners of failure or success was whether or not we had the presence of cross-class cooperation: Were folks with access to resources willing to put those resources on the table at the critical moment or not? In one case, there was just not enough of that to be able to tie up property, and in the other case there was. The result? My startup in Laramie, Wyoming landed, whereas the one I worked on a dozen years before in Albuquerque, New Mexico didn’t. Part of my motivation in writing this particular article is to put a bug in the ears of middle- and upper-class readers of Communities. Class is similar to race and gender in that oppression based on these categories needs to be addressed by the folks who have the power: you have to take seriously that classism is a thing, and ask what you can do to end the power imbalances you are currently benefiting from to others’ detriment. Just as sexism will only end when men do their work and racism will only end when white people do theirs, people with class privilege are in the responsibility seat with ending classism. I’ve been thinking a lot about reparations lately in the context of my own work around ending racism. A lot of folks think reparations are a fine idea but they struggle with what exactly that would look like. I’ve slowly come to the conclusion that it doesn’t look like “a” thing and that trying to figure out “the” answer is stopping a lot of white folks from being able to do something tangible that will amount to embodying reparations. As an example of individual acts I’m working on engaging in to embody reparations: I’m working to cede talk time to people of color regularly in conversations, and I’ve offered to a teaching partner who is a person of color to have them take home a higher percentage of the money we make in any work we do together. These are both actions that move beyond “nice thoughts” and into starting to shift power relationships. I think there is a parallel around class dynamics. Individuals and organizations can take concrete steps to change both the narrative on worth and worthiness of getting needs met, and the concrete deleterious effects of that narrative on people’s ability to get their needs met. One of the organizations I work for, which was until recently an all-volunteer effort, has recently begun paying poor and working-class folks for the same work that middle- and upper- are still asked to do as volunteers. This is a concrete recognition that some people can afford to volunteer while others can’t, and it makes possible the inclusion of poor and working-class people in work they’d otherwise be cut out of. Am I willing to forgo my earning of equity in this project, recognizing that the earning of equity is embedded in an oppressive economic system that is available unevenly to different people in this group, and means others will have to struggle more? Can I commit to acting in solidarity with working-class people in tangible ways? Examples of this are: not advocating for meetings or all the fun stuff happening during work hours, not asking working-class and poor people to pay for childcare to participate, not throwing parties that will cause pain to less wealthy people (such as slideshows about what I did on my summer vacation that often amount to wealth displays), and recognizing that working-class and poor people generally have not only less money but less “free time” to contribute, and not shaming them or creating participation barriers based on what they can or can’t contribute. Can I commit to learning about classism and wealth discrepancies, such as checking out the Class Action website (classism.org), and encouraging my group to get full-group training around these issues? Do I have concrete assets that I could flat out give the group, such as land or funding for a no-questions-asked emergency fund? Can I offer critical support such as childcare, transportation, and help filling out governmental assistance paperwork to folks who need these things in my group? Can I do things like these without asking to be thanked for it, but simply because it is the right thing to do in terms of balancing the scales of justice? There are also many initiatives you can support to help us all embody a new paradigm beyond class oppression. These include individual communities like Cooperation Jackson, the Parable of the Sower Intentional Community Cooperative, and multiple subnetworks including People of Color Sustainable Housing Network and income-sharing groups (some of whom are organized by the Federation of Egalitarian Communities, www.thefec.org). Broader ways to explore these issues are by checking out the New Economy Coalition’s work, and my own (working-class) community’s podcast, Solidarity House, which looks at cooperative systems through a liberatory framework. 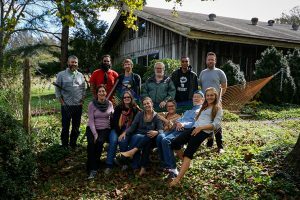 You can also get behind the Fellowship for Intentional Community’s initiative to create the national Community Land Trust for Collective Liberation. This new initiative is being created to hold property for groups who could otherwise not afford to create community, and to remove land permanently from the speculative real estate market (which over time drives up the cost of land for all of us). The CLT will be a place of radical solidarity between poor and working-class people, people of color, and the land. The project will use the frameworks of intentional community and community land trusts, and is part of a larger growing movement toward cooperative culture, collective liberation, and racial and economic justice. FIC wants to use this project to ask ourselves and the communities movement as a whole questions about what reparations and decolonization mean within our movement. These are hard and important questions, and we hope you will join us in asking them. And we absolutely will need cross-class cooperation to pull this off: my best estimate of an initial five-year operating plus land-purchasing budget is somewhere in the ballpark of $20 million. Cross-class solidarity has always played a role in our movement. I’m hoping that role will be more acknowledged, deliberate, and celebrated as we move forward, collectively. Yana Ludwig is a cooperative culture pioneer, intentional communities advocate, and anti-oppression activist. She serves on the board of the Fellowship for Intentional Community and works as a local chapter coach for Showing Up for Racial Justice. Her latest book, Together Resilient: Building Community in the Age of Climate Disruption, was awarded the Communal Studies Association 2017 Book of the Year Award. She is a podcast host on Solidarity House (advocating for cooperative culture and economics) and a founding member of the Solidarity Collective, an income-sharing community in Laramie, Wyoming.